Ensuring a confident and stylish on-court presence, the Head Club Technical men’s polo shirt comes with a classic 2-button collar, and it’s made from breathable combination of fabrics including Ergostretch, and special mesh inserts. For smooth, unrestricted manoeuvrability, there is the Ergofit technology, plus the polo shirt includes supreme moisture and sweat wicking properties thanks to the Endodry tech. Moreover, for added style points, the design includes a refined Head branding logo on the chest. 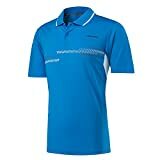 This entry was posted in Tennis and tagged Club, Head, Mens, Polo, Shirt, Technical by FPSports. Bookmark the permalink.